Daiso is like an Aladdin’s cave of wondrous things that you never thought you needed till Daiso told us so. Stepping in there, it’s so easy to get carried away – I dare you to tell me otherwise! Before I know it, I’m staggering up to the cashier with a basket piled high with all sorts of random items. The worst part is that RM5 adds up very quickly! 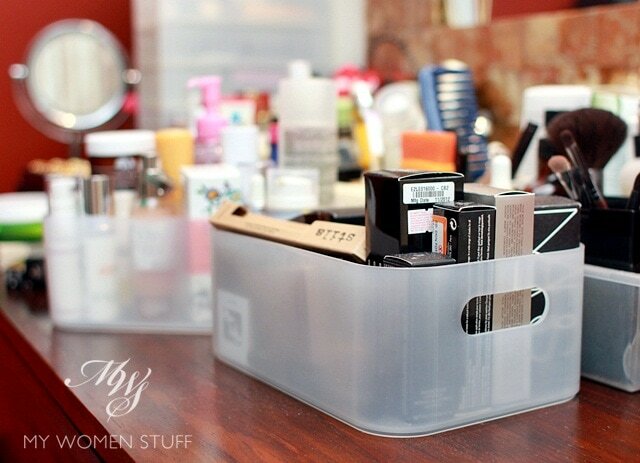 The item is this innocuous looking plastic box, which is known as a Stackable Storage Box and you can find it at the section where they sell all the different types of storage boxes available. I picked up a few a couple of months ago, because I wanted something that would help me keep my dresser and drawers organised, but didn’t want to pay for something from Ikea (functional but expensive) nor Muji (ditto). In fact, it was while I was in Muji buying my PP Storage box that I first saw similar looking storage boxes but I wasn’t up to paying for them either. What can I fit into that dinky, compact, well-designed Muji makeup pouch? Buy enough makeup or skincare and chances are, you never ever have to buy a makeup bag/pouch. Hands up whoever agrees with me LOL! 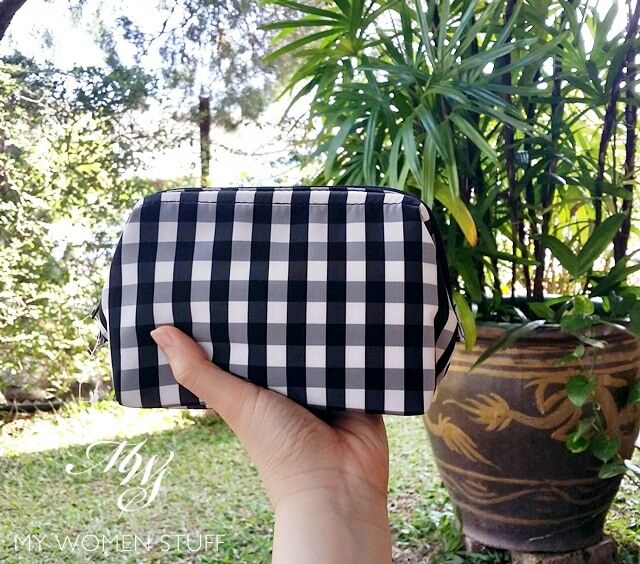 😀 I don’t know how it is overseas, but here, GWP (Gifts with Purchase) are common and a common GWP is a fancy makeup pouch. Heaven knows, I’ve collected, given away and used so many free makeup pouches in my time. It came to the point that I’d actually decline a free makeup pouch because I have a cupboard full of them! Yet quite recently, I bought one. I blame my friend Xin, who texted me one evening with her dilemma as to whether to buy this adorable makeup pouch she discovered at Muji. But there was a reason I wanted it, and when I took it home during the Chinese New Year break recently, I discovered just what a nifty little thing it is. Yes, emphasis on little, because it isn’t very big is it? As you see in the picture, it sits in the palm of my hand quite comfortably and it barely takes up any space, yet it’s like Mary Poppin’s bag in there – it fits a ton! Benjabelle Brush Tree : You didn’t think you needed it, did you? Here, add this item to the list of “Things you didn’t know existed or needed till you have it” because that’s how I felt about the Benjabelle Brush Tree. I saw this sprout (sprout! Tree!) online a few years ago and as I always always do, I sniffed, turned my nose up at what I figured was yet another gimmick to make people waste money, and swore up and down that drying my brushes flat was the way to go. I’m often too sceptical for my own good. Alright, the difficulty to get hold of it played a major role. It cost a lot to ship to Malaysia from the USA and I soon promptly forgot about it. However, a friend and entrepreneur, Romana of MyMakeupOrganizer brought this into the country last year and rekindled my interest, so I picked one up. I told myself it was to assuage my curiosity and I still kept my sceptic hat on. But sceptical as I am, I cannot deny that the Benjabelle Brush Tree is a very clever little contraption that deserves its accolades. 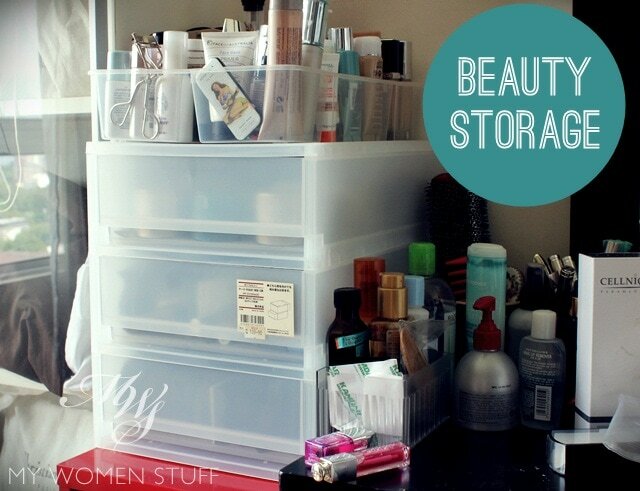 Beauty Storage Options: Drawers from Muji solved my messy problem! You know the Chinese New Year is near when I start panicking and doing mega spring cleaning of my house at every opportunity. I feel like the White Rabbit sometimes – no time! no time! Because we have but a couple of weeks more to go before we welcome in the Lunar New Year and I’m not even done yet. Sigh… Last weekend saw me tackling the madness that was my dressing table and I knew without a doubt that I needed some decent storage.